At Manhattan, an admission counselor is dedicated to transfer students to make the transition smooth and easy. Students can have their unique needs met all in one place while exploring the many opportunities on campus. The credit evaluation process is also done in a timely manner so transfers can begin as quickly as possible. With over 160 years of history, the College is at the forefront of outstanding comprehensive colleges. Through the years, one constant has guided the College—the Lasallian Catholic heritage upon which it was built. Christian Brothers and lay teachers alike have educated generations of leaders with programs in the liberal arts, business, education and health, engineering, and the sciences and nearly 50 major fields of study for virtually any chosen profession. Following in de La Salle’s footsteps, Manhattan College students actively define their commitment to social justice by trading their traditional lifestyles for immersion and service experiences around the city, country, and world. Each year, Campus Ministry and Social Action (CMSA) runs its L.O.V.E. program (Lasallian Outreach Volunteer Experience), which gives students the chance to travel to some of the world’s poorest areas in New Orleans, Kenya, Ecuador, the Dominican Republic, and West Virginia to volunteer with people of different socioeconomic backgrounds. 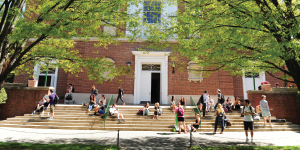 The tight-knit College community is composed of over 4,000 students. With a 12:1 student-faculty ratio, our professors know students personally and care about their success. The majority of students live on our traditional collegiate campus, which is just a subway ride from the city center. In addition, many students take advantage of the College’s New York City location and intern at some of the world’s leading companies. 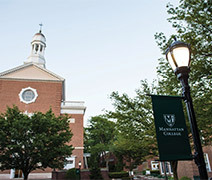 Manhattan College’s rolling admission process allows students to transfer in both the fall and spring semesters. Each week transfer applicants can also participate in Transfer Thursday, a unique campus visit opportunity that provides prospective students the chance to take a campus tour, meet with an admission representative, and receive an instant admission decision prior to the end of their visit. Once students have been accepted, the straightforward credit evaluation process enables students to make the most of the credits they have already taken, and a financial aid package is prepared to evaluate for academic scholarships, need-based financial aid, and state and federal grant, loan, and work-study programs. Students who want to live on campus are guaranteed transfer housing to make the move worry-free, and most choose to live in either suite- or apartment-style on-campus housing. 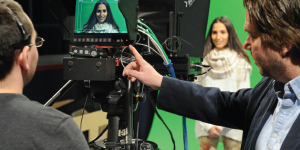 To learn more about Manhattan College and how to transfer before the next semester, visit manhattan.edu/transfer, call 718-862-7200, or email admit@manhattan.edu.